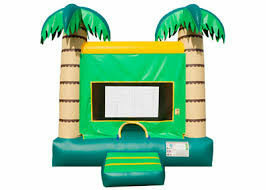 Create a tropical setting at any event with our Tropical bounce house. With its yellow, green and tan color theme, these Palm Trees are sure to stand out in everyone's eye. It is a compact ride, designed to fit into almost any yard. The 15'x15' Tropical bounce house is enough to safely accommodate up to five riders. This is a great product for any occasion, so be sure to have a Tropical bounce house for the next party. Standard castle one of those great party themes, and it can go wet.